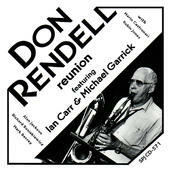 I first got to know Don's music when he played with Ian Carr, He could be a hard-driving and also lyrical tenor player and was also accomplished on Clarinet, Soprano and Flute. In the early days of the Newcastle Jazz Festival, he would come up with small combos that we could just afford along with Tony Crombie, Dave Green and other luminaries of around 1970. We all got to know him well through when he started a teaching and playing relationship with the Big Band. Don stayed with us and although he was a committed Jehovah's Witness he never sought to foist his beliefs on others. Just after he'd left though there would be the odd copy of Watchtower or Awake conspicuously on a bookshelf or the bedside table. Due to the vagaries of the MU rules at the time, he appeared as an anagram on the Album as Dene .N. Droll along with Ken Gibson (Geno Binks) and Henry Lowther (Ethel Wryhorn). then made us play in 1/8 time, ¼ time, ½ time and then finally "A Tempo".The difference was amazing. Don's career spanned 60 years in the 50s he was in the band that accompanied Billie Holiday on tour in the UK and until quite recently he was teaching at the Guildhall School of Music. We've lost a brilliant teacher, performer and a fine human being.